I was recently shopping at Big W and saw these pants on the clearance rack for $5.00! I was immediately attracted to the soft fabric and the pretty blue print. Problem: they weren't my size. But that has never stopped me before! What was most important was that they were LONG - really long (due to the larger size I guess). I'm simply demonstrating how they were not close to my size, making this an extreme refashion. As I had plenty of fabric to work with I wasn't very delicate with my refashioning. 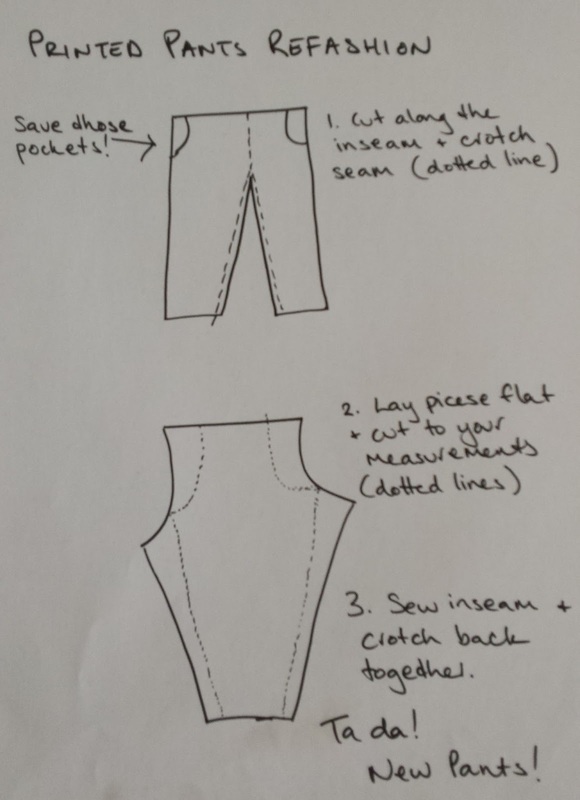 I cut up the inseam and the crotch seam. I didn't want to take them in from the sides because they have pockets... and why would you mess with pockets?! 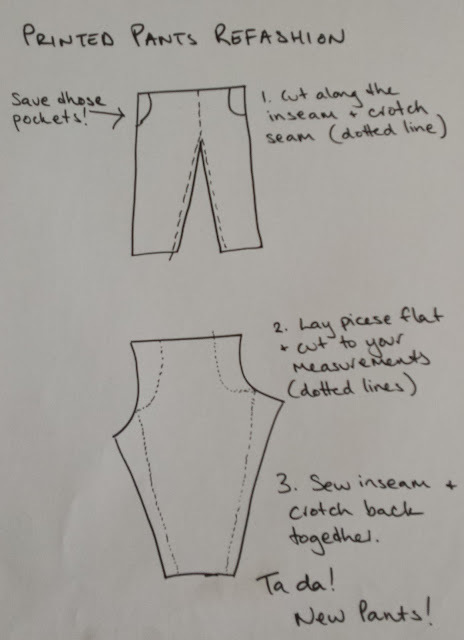 Also, the depth of the rise (crotch seam) was too long for me and by taking it all in I gave myself extra inseam length - bonus! I'm loving my new pants!! Teamed here with a simple white tee, green earrings and tassel necklace (both made by me) and my super comfy Naturalizer sandals from last summer. Such a cool refashion! I love how you have such a good eye for turning anything with a good fabric/print into a fabulous garment (like these pants and the duvet cover you made into a skirt). Bravo! Cute sandals! Would love you to stop by and add a link to my weekly fashion link up if you get a chance. Love your refashion!! Your new pants looks great on you. Such a cool casual look. Love the necklace. Thanks for being a part of Fun Fashion Friday. Hope your weekend has been fab! Great pants!! Man, I wish I could sew!! !